The Supreme Court heard oral arguments in United States v. Texas. 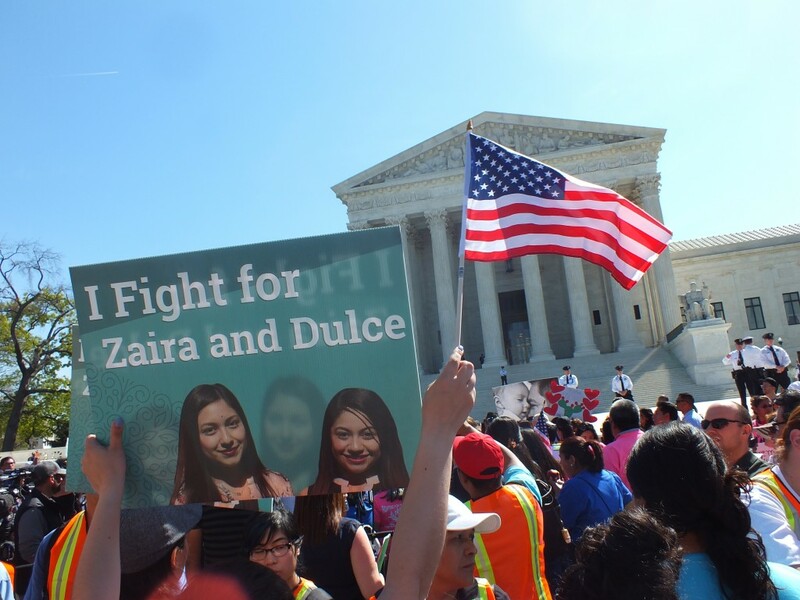 While lawyers presented their arguments before the eight Justices inside, on the outside families, advocates, immigrants, faith groups, and a wide range of civil rights and community organizations gathered to demonstrate support for the President’s initiatives. The thousands of supporters in attendance overshadowed the handful of counter-protesters by sheer numbers and energy with songs, chants, and individual stories over the three-hour period leading up to and during the Supreme Court session. Many who would be eligible for DAPA or expanded DACA traveled from across the country to share their stories at the Fight for Families Rally. They spoke about what it means to live in fear of deportation and what it would mean for their families to stay together and support themselves. They were joined by national and Congressional leaders, including Sens. Richard Durbin (IL) and Bob Menedez (NJ), and Reps. Joaquin Castro (TX) and Jan Schakowsky (IL), rallying the supportive crowd that echoed their calls for justice and family unity. Inside the Court, individuals who will be impacted by the Court’s decision were in attendance along with immigrant rights’ advocates who shared what they heard in the courtroom. While media reports indicate the court was evenly divided in their questioning, it’s very difficult to predict the outcomes of a case based on oral arguments. Much is at stake in this case, not the least of which are the lives of the individuals who could qualify for these initiatives, and the Justices seemed to acknowledge that. However, they also seem mindful of the dangerous precedent that could be set it states are allowed to bring their political disagreements with the federal government before the court. A decision from the high court is expected in June of 2016.